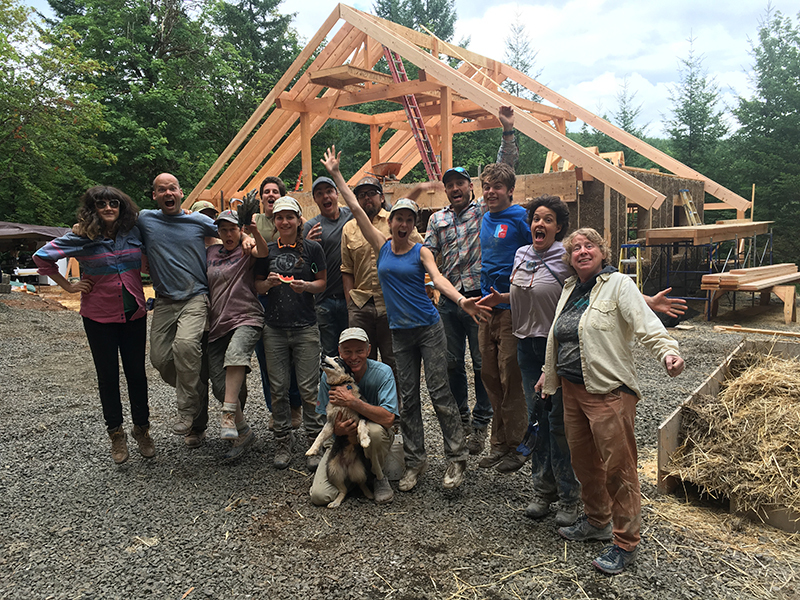 Nearly anyone who has participated in an EcoNest workshop will tell you that, like the home they are building, the friendships that grow from the ground up contribute greatly to the rewarding experience. Students in our Boot Camp program spend 6 weeks working closely together. Bonds form between students of all ages and from all backgrounds because of one common interest: natural building. Some of our students have work or educational experience in construction and others arrive at EcoNest simply with a passion for learning more about healthy building. 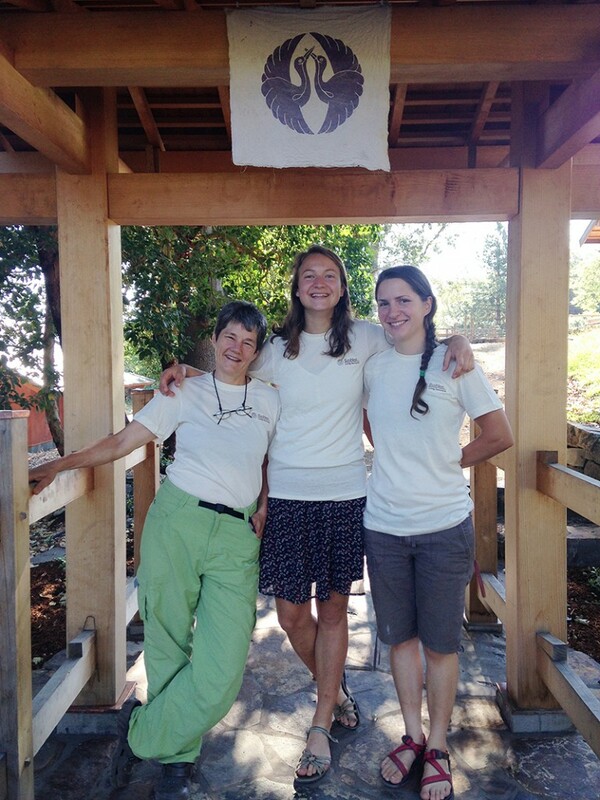 Our most recent series of workshops in Banks, Oregon, brought a first for EcoNest: all three of our Boot Camp students were women. Also, our home-owner and half of our Intensive (3-week program) students were women. Meet Ari, EcoNest student, workshop host, and homeowner. Ari writes: It was around this time last year that my search for a natural home began to take shape. I’d been living on a back to the land-based project in Cottage Grove called Aprovecho. While there, I had the experience of sharing space in naturally built shelters. I found that while being in these spaces, many of my previous health problems including severe allergies had waned. Not long after, I attended the Mother Earth News Fair in Albany and happened upon EcoNest’s first book, “Creating Sustainable Sanctuaries of Straw, Clay & Timber.” I gave Paula & Robert a call and signed up for their Homing in Your Nesting Instincts Seminar. The rest, we can say - is history. After this seminar, I became committed to the pursuit of creating a space for myself and others who wish to be in natural sanctuaries, close to the land. I was fortunate to be able to participate in the building of Julie & Andrew’s home in Mt. Shasta California this past Spring. Being there gave me a glimpse into the role of student, as well as host for an Econest workshop. After a satisfying week, and good sleep thanks to the physical labor of straw & clay- I hit the ground running to prepare for my own workshop, which would start not long after. As I sit here, looking at the ‘bones, flesh, & hat’ of my home- I am incredibly grateful to the amazing group of people who came from all over to help build it. For those unfamiliar with EcoNest lingo, the bones are the timber frame, the straw-clay filled walls are the flesh, while the roof is the hat that sits atop. Hosting a workshop, while not without its challenging moments, was the best way I could have imagined to bring this dream into a reality. Ultimately, it was the thoughtfulness, energy, soul and laughter that the 2016 Summer EcoNest group put into this home that makes it a living sanctuary. I look forward to opening my finished home to the group as well as anyone else who would be interested to have an experience of being in an EcoNest in the Pacific NW. Please feel free to contact me if you’re around this neck of the woods. Carole came to the workshop from Portland, Oregon. During her residency, she heard Robert Laporte speak about straw clay building. Fast-forward a decade. . . Carole has put her career as a Naturopathic Physician and Acupuncturist on hold as she learns all she can about natural and healthy building. 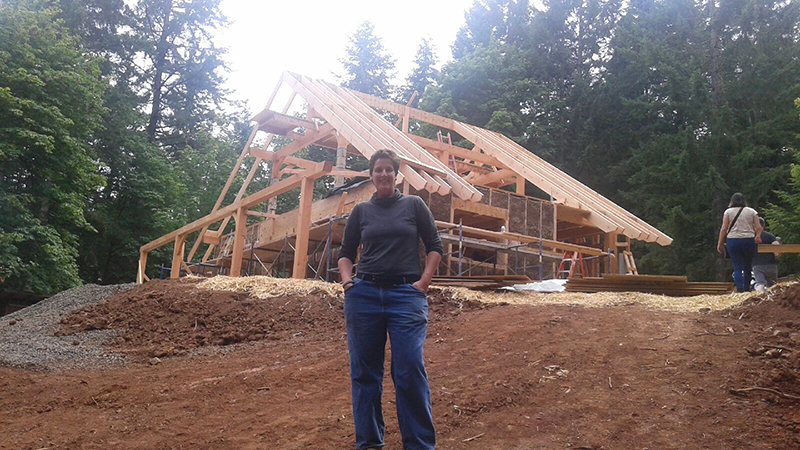 The idea of a strong, beautiful timber frame home with straw clay walls that she and her husband can build together is so appealing that they have purchased land and plan to start construction in a year. Carole is learning the necessary building skills while her husband, a physicist, is learning electrical skills. About the EcoNest Boot Camp, Carole said, “I was surprised how much I learned about myself in this process. I also got a much bigger idea of how much I don’t know, but I don’t feel as overwhelmed by what I don’t know.” She is feeling the strength of the network she has built this summer – she knows she has lifelong friends who will jump to come help build her home, just as she will help them when they are building. Just knowing she has so many resources and connections makes the idea of building her own home an achievable goal. Laerke joined us from Denmark. In a remarkably small world, she grew up living next door to Flemming Abrahamsen, a natural builder in Denmark. Flemming and Robert had met several times and even taught natural building together. Laerke spent her childhood helping out Flemming and later working for him. When her friends were all leaving for college, Laerke wasn’t sure what she wanted to do. She looked into studying architecture but was discouraged at how small a role natural, healthy and sustainable building design played in most programs. Laerke traveled to Argentina to volunteer on natural building projects but found that she was not getting a real hand-on learning experience. Flemming told her about EcoNest, but warned her that she probably didn’t have enough building experience to be accepted into the 6-week program. So of course, she had to apply! Robert sensed that her enthusiasm, intelligence, and desire to work hard and learn outweighed her lack of experience. He was right. Laerke is taking her knowledge and building skills back to Denmark and plans to continue to study and pursue her passion of natural building. Her first step will be to study physics, chemistry and engineering to better understand the science behind healthy construction.